The Einwohnerwehr, the irregular citizens militia, was the closest thing to an army in the demilitarised free city. Hitler’s celebrated “legal” method of taking power seemed to be leading nowhere. This mood affected the SA men in Danzig even more than those in the Reich. The Danzig SA was isolated, cooperation with the militia was poor, and the way to power appeared blocked. In the summer of 1939 the Danzig Senate decided to form a Home Defence, and the responsibility for this was taken over by the Reichsführer-SS. Those members who supported the struggle for superiority in the militia required a badge of recognition. 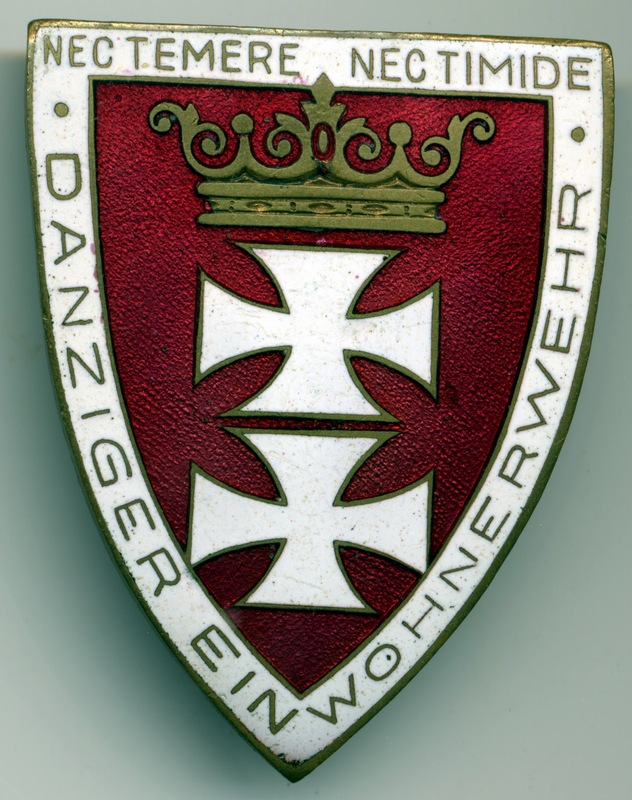 The Home Defence Badge was introduced by the founder of the Danzig Allgemeine-SS unit known as the SS-Heimwehr Danzig, and was supposedly awarded only 15 times. The badge is also known as the Danziger Schild fur Treue Dienste der Stadt Danzig or Danzig shield for true service to the State of Danzig. The exact criteria for award are uncertain, but are most likely for meritorious service in the defence of the Free State and the Nazification of the Einwohnerwehr. The badge comprises of the double cross and coronet emblem of Danzig, on a red, shield shaped field, with white enamelled border bearing a legend. 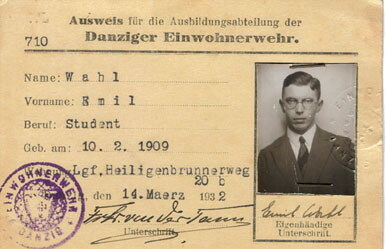 "Danziger Ein Wohnerwehr". It comes in two sizes, a large pin backed badge for wear on military uniforms and for wear on civil clothing as a lapel stickpin badge. The large pin backed badge measures 48 mm high with sloping sides. 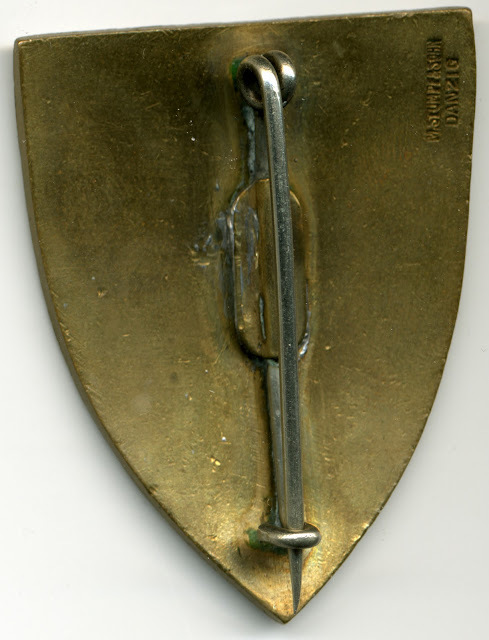 The reverse is slightly concave, gilded, with a vertical silver coloured safety pin type clip that is attached by a lozenge shaped plate. In the right hand upper corner is the maker mark stamped in two lines, M.Stumpf u Sohn, Danzig. The small version measures 21 mm. The reverse is flat, gilded, with a vertical silver coloured needle pin that is attached by a circular shaped plate. The maker’s mark is stamped in two lines, M.Stumpf u Sohn, Danzig, at the tip of the shield.